CHICKEN IN SPICY GUAJILLO Our chef's answer to buffalo chicken. 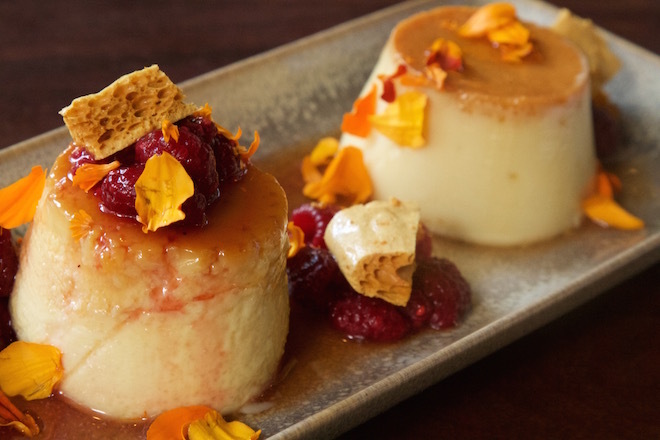 DÚO de FLANES Duo of Mexican caramel custards: classic Mexican vanilla and yogurt flan with Toress orange liqueur. 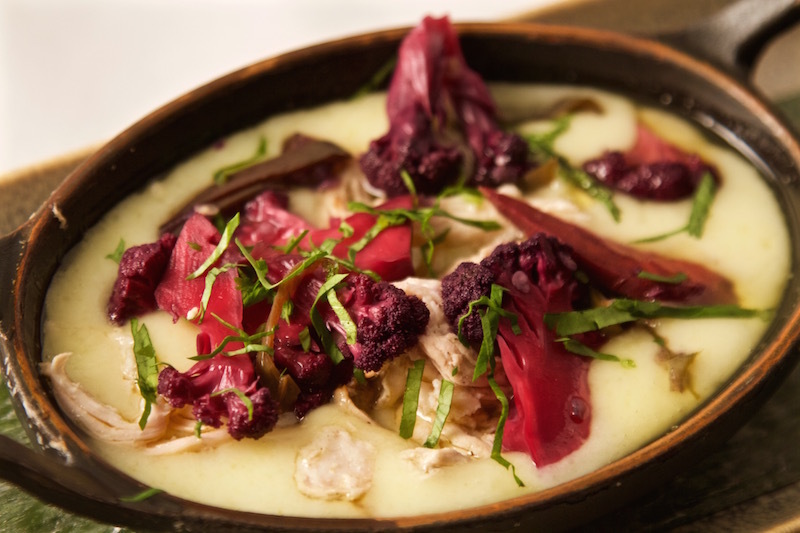 SMOKED CHICKEN FUNDIDO With chef's choice of pickled purple vegetables. 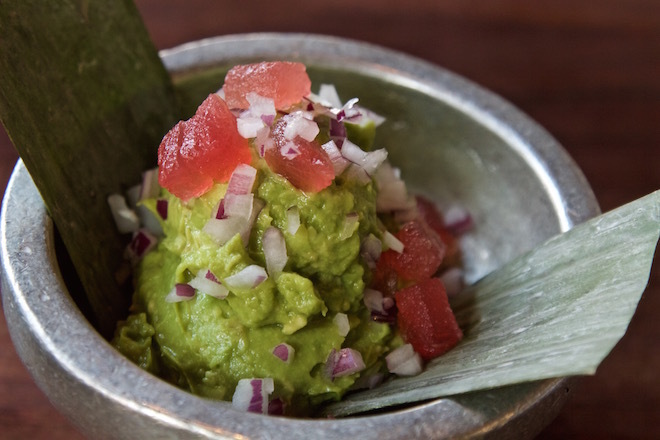 Like so many of Frontera’s guests over the years, let’s start with the guacamole. Specifically, let’s talk about our “summer guacamole,” topped with a spectacular array of additions from local farms: cubes of compressed (that’s super-flavorful) watermelon, crisp cucumber, cooling mint and floral habanero chile. 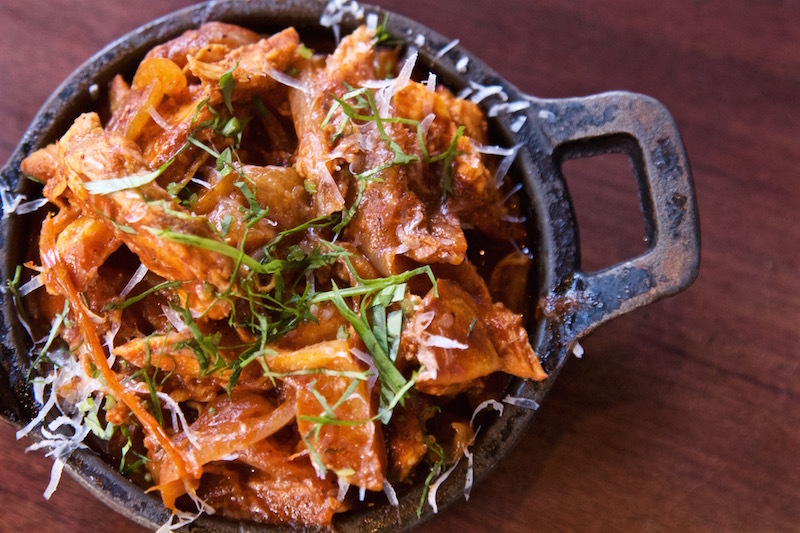 This menu is also highly collaborative: Together, our chef team created a stunningly delicious dishes, including the Eggplant Garnachas: salsa negra-glazed eggplant and mushrooms nestled into handsome little masa boats infused with red chile and sweet potato. Still, that doesn’t mean Chefs Jim Ortiz and Richard James held back on putting their own touches on the menu. See Jim’s buffalo chicken-inspired Chicken in Spicy Guajillo, for example. Actually, don’t just see it. Eat it. It’s ah-mazing. And Richard being Richard, he took in a whole bunch of pecans from former Frontera chef Tracy Vowell’s family farm (see, collaboration!) and made a toasted pecan-pasilla sauce for the Goat Cheese Tamal. “While I was tasting it, I thought adding some of our house-made chocolate would add some complexity. And it was totally a hit,” he said. 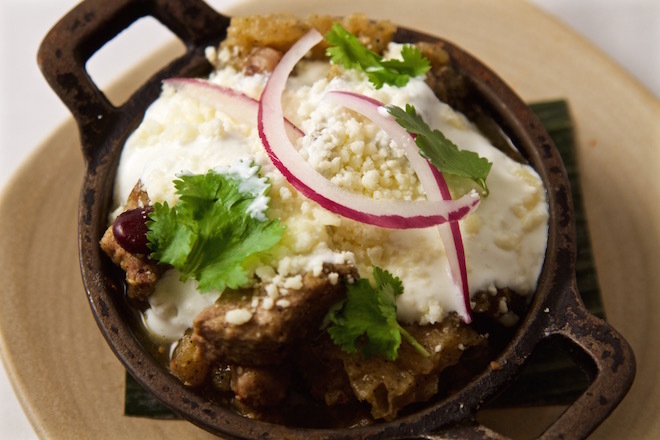 The Pork in Tomatillo cazuela is, in its own right, a collaboration. 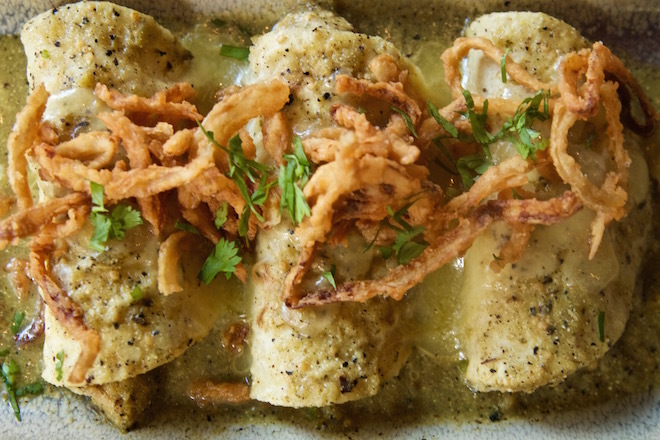 Our guests loved it on last month’s menu, so instead of replacing it, our chefs decided to move it out of crispy masa boats and into cast iron cazuelas. 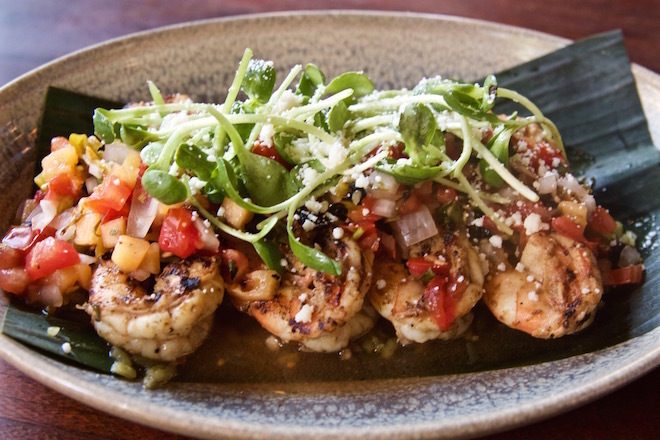 You’ll need more tortillas. 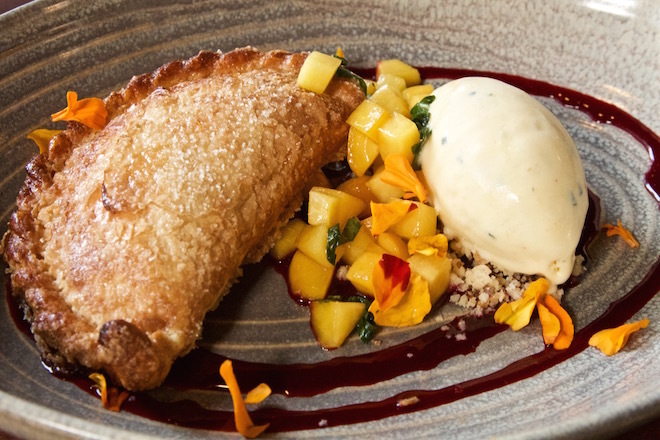 On the sweet side, our pastry team once again dazzles with their seasonal take on Duo de Flanes (classic Mexican and orange liqueur-infused yogurt flans), a buttery, flaky Peach-Cream Cheese empanada with peach-hoja santa ice cream and Sopa de Frutas, this one made featuring a light and refreshing watermelon-mint sorbet and sparkling mint broth. Also, do not — we repeat, do not — miss the Plum Cobbler. It’s a warm cobbler of plums and pluot (like an apricot and plum), with a cornmeal biscuit top, sweet corn and blueberry ice cream (! ), Iriquois white corn crumble and Methley plums. 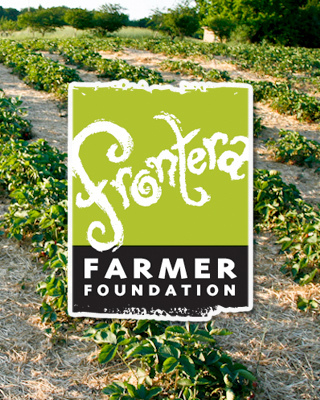 It’s the best of the season, and it’s time to make a reservation at Frontera.